Transform a Necessary Function into a Strategic Advantage. 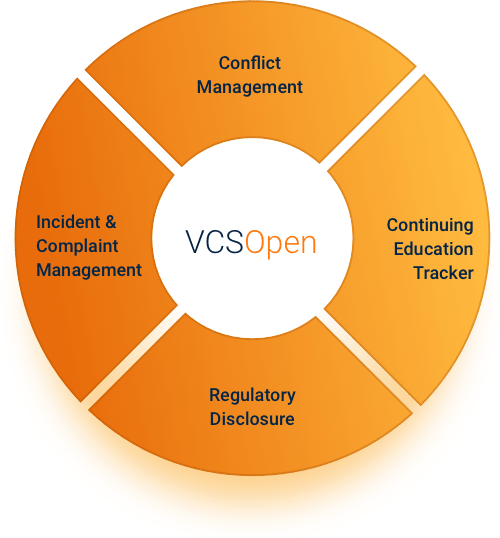 VigilantCS offers the basis for a common industry-wide platform driving down compliance costs, developing industry best practices and benchmarks. Compliance is a particular challenge for smaller firms, such as boutique dealers and specialized portfolio managers. The VigilantCS platform enables you to focus on your core business by providing your Chief Compliance Officer or external consultants an efficient solution for the automation of routine tasks. The competitive landscape and regulatory changes have especially challenged mid-sized wealth managers as operating costs have increased. While the twin benefits of reducing compliance costs by up to 30% and increasing adherence to regulations may seem like wishful thinking, VigilantCS delivers on both counts with the power of automation. Integrated firms under the auspices of Basel III will soon be required to quantify staff conduct risk in determining capital requirements. VigilantCS ushers in a new era of compliance that enables you to mitigate staff conduct risk through preventive action by tracking and analyzing activities to pinpoint areas for improvement. VigilantCS provides benefits to all key constituencies involved in meeting staff regulatory requirements, from individual staff members, officers and directors. existing corporate platforms through our API architecture. One central staff-facing portal for efficiency. staff compliance health drilling down to core issues. improved internal controls and enhanced staff-level accountability. VigilantCS makes it easy for employees to stay on top of regulatory disclosures, providing peace of mind for them and their firm. Our detailed disclosure module includes more than 20 fields required by regulators and provides staff the opportunity and ease of updating information through a user-friendly interface. Real-time staff updates make the yearly attestation process more robust and easily managed by compliance. Many firms seek to outsource some or all of their compliance efforts in order to reduce costs and stay on top of best practices. VigilantCS accommodates firms using an outsourced or in-house model and everything in between. With VigilantCS, staff-related compliance matters are in one place, improving individual accountability and enhancing compliance efficiency. No more hopping between applications for regulatory disclosures, continuing education, personal trading, attestations, social media declarations, and other disclosures. VigilantCS brings it all together in a centralized hub. With staff accustomed to using VigilantCS as their central hub for all things compliance, they will learn of any new requirements quickly and efficiently, enabling firms to implement changes expeditiously.